Ribeye STEAKS On The BBQ, NOT Ribeye ROASTS!!! For weeks I’ve been plotting and planning on taking a really nice roast and putting it on the rotisserie and cooking it that way. I’ve thought of how to season it, how to wrap it so it’s round and will cook evenly, how to this and how to that. 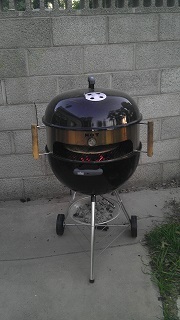 Today I figured a nice 3 lb ribeye roast on the rotisserie using the Smokenator 1000 and the IQ110 would be outstanding. 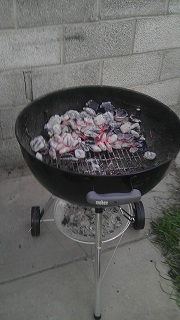 Last night, I seasoned the roast and today I wrapped it in string so it was round and stuck it on the spit and put it in the Weber Silver at 300 degrees using the IQ110 to keep the temperature in line. 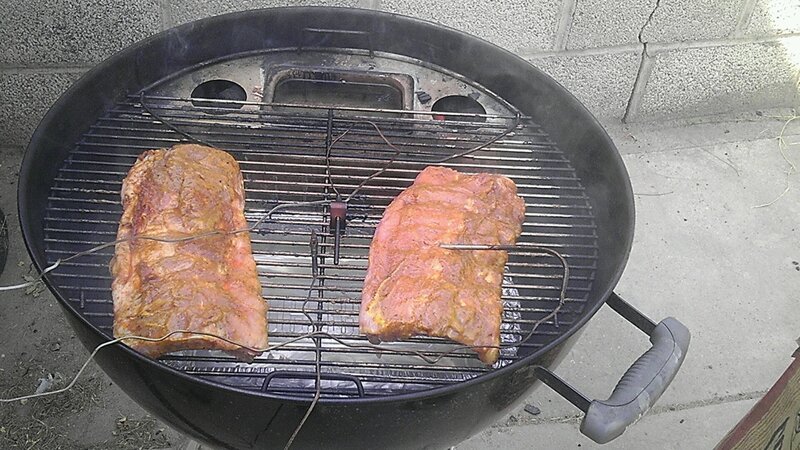 I used a little bit of hickory wood and a little bit of mesquite wood for some smoke flavor. 2 1/2 hours later, the roast was done. I took it inside, let it rest and sliced it. We had some wild rice beef flavored and some caramelized fennel to go with it that was pretty darn good. First thing I noticed was the drippings/gravy was pretty yucky. Too spicy and way too weak. Fortunately I hadn’t added it to the roast. Then I tried the roast. The fatty part was pretty bad. Too much of something and not enough of something else. I’m not exactly sure what, but it was not very good. The heart of the roast was better, but was still nowhere near what I was hoping. 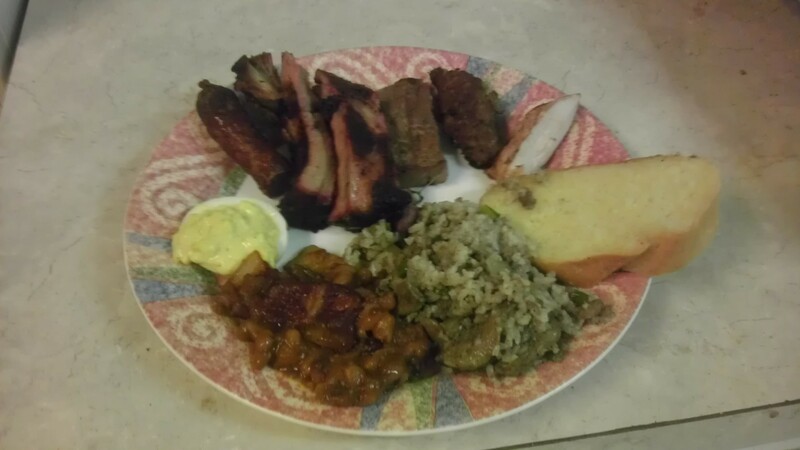 It was edible, but definitely NOT one of my better dishes. I won’t be fixing that again. OK, I survived my work trip! Whew! Now I’ve got time to do a post or 2. Three of my favorite side dishes involve a good sized pot of boiling water: ‘Tater Salad, Mashed ‘Taters, and Deviled Eggs. I get a 2 fer 1 on the potato dishes plus the eggs get cooked at the same time. It all starts with about 2 lbs of your favorite kind of ‘taters, scrubbed good and cut into 1″ cubes. Nope, I don’t peel ’em. I put those into a pot of warm-from-the-tap water with a generous bit of salt and pepper, turn the heat on high and let ‘er rip till the water boils. Usually, I’ll gently place 4-6 whole eggs into the pot with the potatoes at the start. I let everything boil until the potatoes are fork tender. By then, the eggs are done, too. When the water first begins to boil, I take a bunch of ice and put it into a sink with about 4″ of water in it. I add ice till it some of it stays ice. Dump the whole pot gently into a colander and let it drain (NOT into the sink with the hot water!). Fish out the eggs and put them into the ice water (don’t crack them yet!). For Mashed ‘Taters, take the rest of the ‘taters and put them into an oven-safe bowl. Add 1/2 C milk (or cream), salt, pepper, garlic powder and 2 Tbsp room temp butter. Take a ‘tater masher and mash them good to whatever consistency you like.. Take a taste and add more of whatever needs to be added. When you’re satisfied with the taste and consistency, put them into a 200 degree oven, covered with foil or a lid. Serve warm. If you want to get fancy, stir in about 1/2 C fresh or 2 Tbsp dry parsley to make Parsley Mashed ‘Taters. Serve with gravy or by themselves. That’s it for now. I’ve got a Ribeye Roast on the rotisserie now that I’ve got to check. 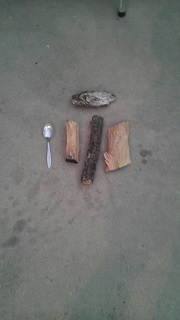 I’ll post how I cooked that later. I travel quite a bit in my job. This week, I’ll be on the road, working 12-14 hours per day. When I finish, get back to the hotel, clean up, grab a bite to eat, I don’t have a lot of energy left. I will do my best to add a little something during the week, though. 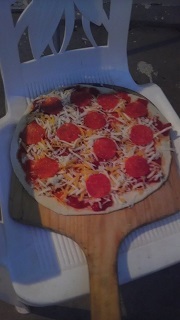 OK, I’ve been mentioning pizza cooked on the bbq grill. Heresy? You bet! 🙂 And I’m PROUD of it! 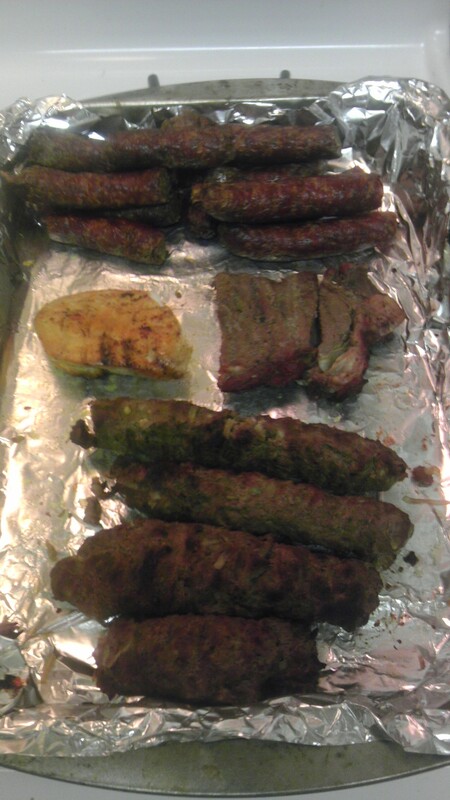 While the dough was warming, I went outside to get the bbq ready. First I got the Kettle Pizza accessory. and added a top grill that I wrapped in foil The foil helps reflect the heat that would usually go all the way up to the top of the dome of the Weber Silver (WS) down to the top of the pizza. 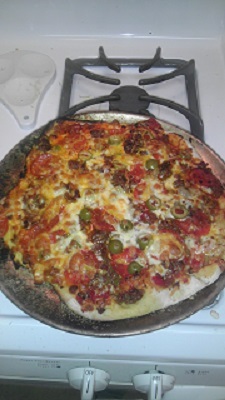 This makes the toppings brown at the same time the bottom crust cooks. 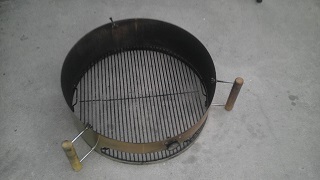 I fired up the coals for the WS, let them get covered with ash and fire coming out of the chimney, then dumped them into the WS on the coal grate. 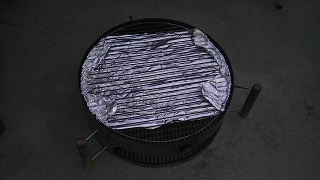 I moved the coals to the back side and put on the Kettle Pizza and the WS top. While that was heating up, I started working with the dough. Like I said earlier, I started the dough Wednesday night. After letting the dough rise per the recipe, I rolled them around and made discs out or them then oiled them up good, put each into a gallon ziplock bag and stuck them in the ice box. They sat in there until about 3 PM Saturday, fermenting away and getting all gooey and poofy from the yeast doing it’s thing (this always makes me think of Alton Brown’s burping yeast sock puppets from his show Good Eats….which also has been cancelled by Food Network…another BUMMER!). I took the 2 dough discs out and divided them up. The Neapolitan I divvied into 4 8 ounce balls (total of around 30–32 oz dough) and the 65% I divvied into 3 10 oz balls (same amount of dough). I squeezed and kneaded each one for about 1 minute, then set it onto a floured piece of foil. After doing all 7 dough balls, I covered them with a dish towel and let them sit for another 1 1/2 hours. When the dough balls were up to room temp and had done a final rise, I took one and pressed and rolled it into a pizza skin. 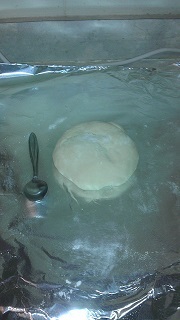 Here’s the initial ball of dough (teaspoon for size comparison) and the skin. Next was putting the sauce on the skin. I used a bottle of commercial sauce with a can of diced tomatoes with basil, oregano and garlic that I drained well. This is standard for all the pizzas. 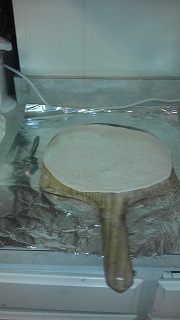 I’ve found that putting the skin on the pizza peel which has had cornmeal spread lightly over it works best. Then top, shake gently to loosen so it slides off onto the stone. 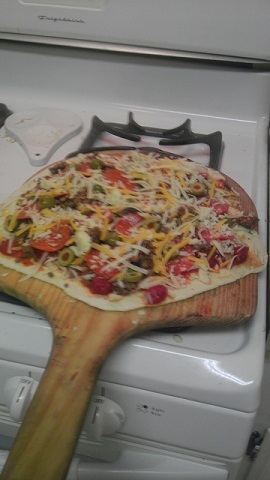 The peel is 12″ wide, so you get an idea of how much you get from one dough ball. Once the pizza was ready, it was time to check the cooker. 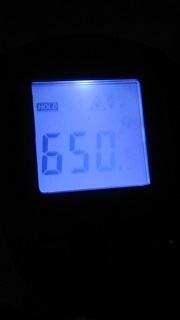 It was up to normal temp which is 450 degrees. 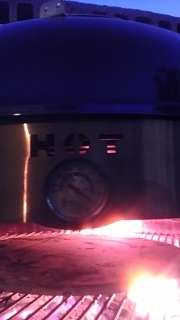 Now it’s time for the really hot part! I have some small chunks of pecan wood set aside in a wagon I take a few chunks (teaspoon for size comparison) and put them directly on the coals (gotta lift off the entire Kettle Pizza setup and replace it) and add the pizza stone to the cooker After just a few minutes, the thermometer on the Kettle Pizza has pegged at over 700 Degrees!! 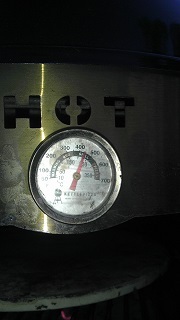 Now that’s approaching the temps the pizza parlors use for their pizzas…..or a bit more than some of them. I’ve got a handheld laser/infrared thermometer I use to check the pizza stone temp. When it’s about 650 degrees F or better, it’s time to put on the pizzas. 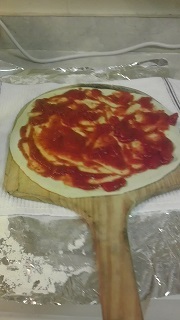 The pizza can either go in directly on the pizza stone or it can be in a pizza pan that goes onto the stone; Directly on the stone, the crust cooks quickest and tends to get those lovely bubbles in them. On the pan, they both cook about the same and the crust doesn’t bubble as much. At these screaming hot temps, I put the pizza in, give it about 1 1/2 minutes, turn it 180 degrees, another 1 1/2 minutes, turn 90 degrees, thirty seconds, turn 180 degrees for thirty seconds and that’s it! By then the crust has wonderful browning marks on the bottom, the cheese is bubbling and the top of the crust sometimes has bubbles in it. Incredible in only 4 minutes!! 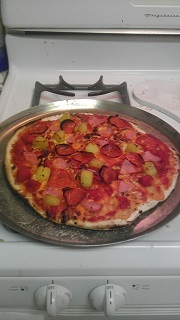 Hmm, wonder why it takes most pizza parlors the better part of 30 minutes to get a pizza ready?? If the heat is really REALLY up there, like over 700 degrees, It only takes about 3 minutes for them to cook! 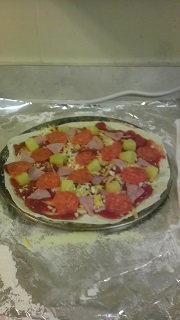 Next I fixed Sweetie her favorite, Hawaiian with pepperoni, Canadian bacon, pineapple chunks and very light cheese. 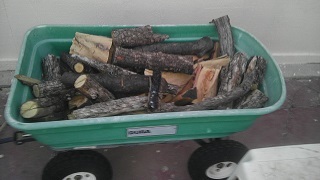 Here’s what it looked like before and after: Note: I have to add more hardwood after each pizza. It really burns up fast at these temperatures! 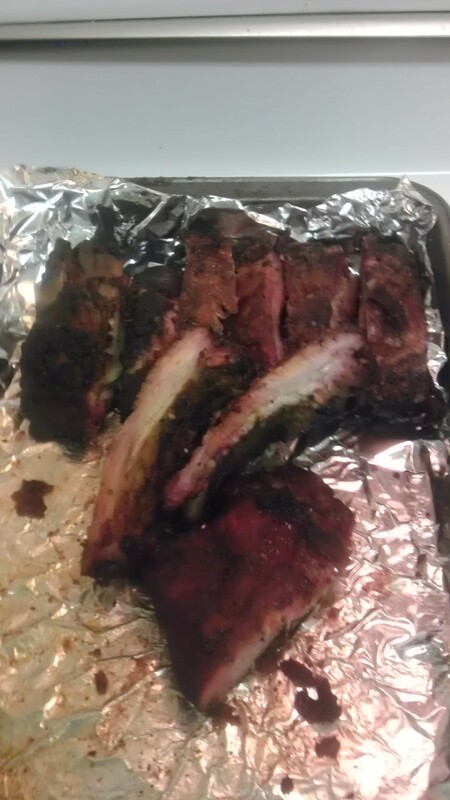 Remember, if it works for you, it’s bbq! !